Can smart locks really help you feel safer at home? Smart homes are considered by some the hallmark of IoT, and with the growth of the industry, increasing numbers of companies want to get in on the action, developing and rolling out smart devices. According to data from consulting firm McKinsey & Company, the U.S. smart home market will reach $29 million by the end of this year. Smart locks on the doors of connected homes? Smart locks will precipitate connected home systems, which is why, according to the VB Profiles database, there are 34 companies involved in the market. UniKey Technologies is one such company. UniKey just finished a venture capital funding round that resulted in an undisclosed amount of money, but before this round, the company had already raised $11.4 million in only four years. Such huge funding rounds can only signal the excitement of the market when it comes to smart home products. As shown in the picture above, UniKey’s smart locks use your smartphones as keys. Users would install the UniKey locking system in their doors, and then place any paired iOS or Android phones next to the lock to unlock the doors. Because the UniKey system uses Bluetooth technology to transmit data, users don’t need to download any apps to make the device work. UniKey also provides a stable user management system that allows users to delete any paired device in the system in case they can’t find their phones or want to set up a specific period of time in which to use the paired devices. The locking system uses unique an encryption algorithm, which, according to UniKey’s official website, provides bank-level security. According to the VB Profiles database, Vivint Smart Home is the largest company in the home security market. So far, Vivint has raised over $900 million, which makes up 83 percent of all funding in the market. The company is heavily involved in the smart home market, producing devices like smart locks, smart doorbells, and connected garage doors; Vivint aims to build a complete, connected outdoor smart security system. 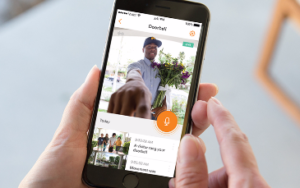 To use the smart access control service, users need to download Vivint’s app, which also has a live function — depicted in the picture above — that’s connected to the doorbell, so users can tell who is knocking at the door. The app also allows users to connect with smart products like Amazon’s Echo, offering a seamless user experience indoors. Both established and up-and-coming brands enjoy their own niches; they try to distinguish themselves from others so that their products will be unforgettable. And while there is nothing wrong with wanting to be remarkable, the constant jockeying for uniqueness has resulted in the absence of a unified standard in the industry. Let’s take Apple’s HomeKit, which is trying to combine third-party smart home products and integrate them with its iPhone, iPad, Apple Watch, and operating systems. Apple wanted smart home companies to use this platform so that customers only needed to use one smart home app. Although the platform supported several brands, apps made by the companies themselves provided more detailed and convenient functions, which led users to download company-specific apps, raising the learning cost for customers and resulting in a subpar user experience. Apple just noticed this problem, so they have begun switching to hardware products for the smart and connected home market. 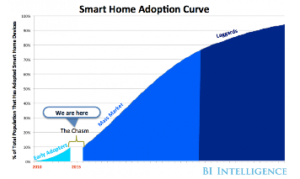 As illustrated by the Business Insider graph above, we are at the beginning of the mass-market production period of the smart home. The consumer market, however, still doesn’t have a flawless business solution with regard to smart homes. Companies that wish to involve themselves in the market should focus on two aspects of devices — security and unity. Although people have embraced technology in their day-to-day life, when it comes to security and safety, people don’t want to take any risks. No company can yet claim that its technology and smart access control services are invulnerable. Enhancing the quality of safety and security services will contribute heavily to the success of smart access control companies, and even the smart and connected home industry as a whole. The market will, in the future, need more interaction and cooperation between companies, rather than endless competition. Connected devices form the basis of the entire smart home industry — so why shouldn’t companies connect as well? 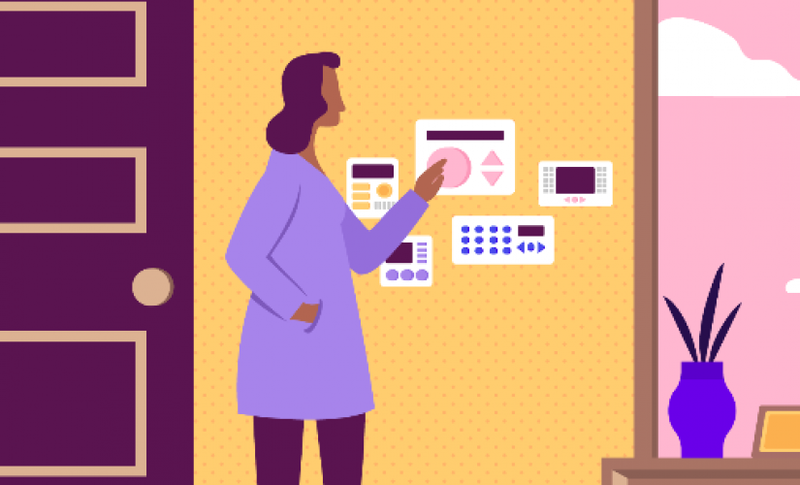 If companies focus on their own products without regard for other devices in the market, users will not be able to experience the seamless lifestyle smart devices promise.